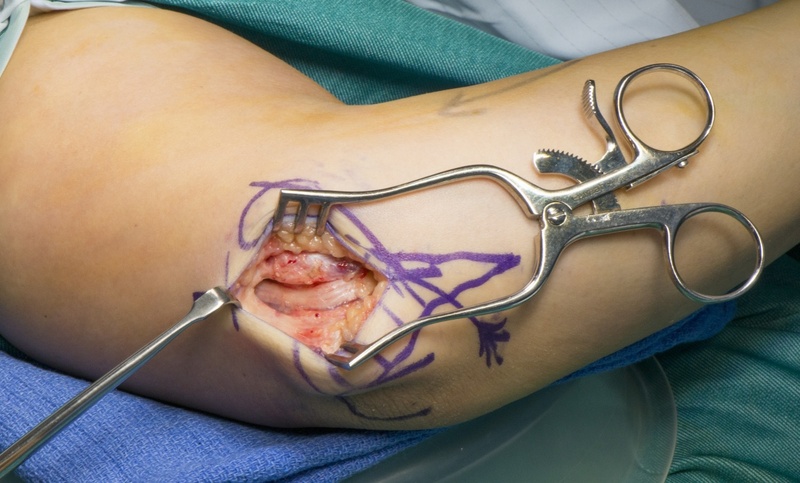 Learn the Cubital tunnel decompression surgical technique with step by step instructions on OrthOracle. Our e-learning platform contains high resolution images and a certified CME of the Cubital tunnel decompression surgical procedure. Cubital tunnel syndrome is the second most common upper limb peripheral nerve entrapment neuropathy. The pathophysiology is poorly understood but most likely is a combination of nerve compression and abnormal tension forces due to the course of the ulnar nerve posterior to the elbow. The ulnar nerve passes from the arm to forearm posterior and medial to the elbow through the medial retrocondylar groove. The roof of the tunnel is formed by a thickening of the deep fascia (Osborne’s ligament) and the proximal free edge (Osborne’s band) may cause a local compression point. The tunnel lies between the humeral and the ulnar heads of the flexor carpi ulnaris. Where the two heads joint there are deep fascial thickenings within the muscle substance and at its deepest extent that can cause compression of the nerve beneath. Surgery to decompress the nerve may not relieve intraneural tension and this may explain the less predictable outcomes from cubital tunnel surgery. Indeed decompression my worsen nerve subluxation exacerbating symptoms. Simple decompression works for the majority of patients, however in cases of subluxation of the nerve or excessive tension a number or adjunctive procedures are described. Transposition of the nerve (subcutaneous or submuscular) anterior to the elbow is designed to shorten the course of the ulnar nerve. However well performed this procedure can produce secondary tether or compression points ay the arcade of Struther’s (distal free edge of the medial intermuscular septum) at the medial supracondylar ridge (against the insertion of the medial intermuscular septum insertion) and at the flexor carpi ulnaris (due to dorsal tether of the ulnar nerve by the proximal take off of the nerve to the ulnar head of the FCU). I prefer a detensioning procedure in cases of subluxation or excessive tension. This involves a partial excision of the medial epicondyle, allowing the nerve to translocate into a more anterior position without tension. This will be described separately.